With travertine we can clean it, refinish it, repair it, re-hone it and re-polish it. Similar to marble, travertine is a metamorphosed limestone that typically forms near a natural hot spring. As the travertine develops, escaping gasses fill the stone with voids and air pockets. These voids occur naturally in travertine throughout the stone. Travertine is by far the most common surface we work on in. We find it most on floors but we occasionally find it on countertops and in showers. Travertine is susceptible to the same issues that face marble. It is sensitive to acid etching and scratching. To bring it back, the system is the same. We go through a diamond refinish process to remove superficial imperfections. We then either perform the final hone or a polished finish. In addition to surface scratches and etches, there is another common issue. 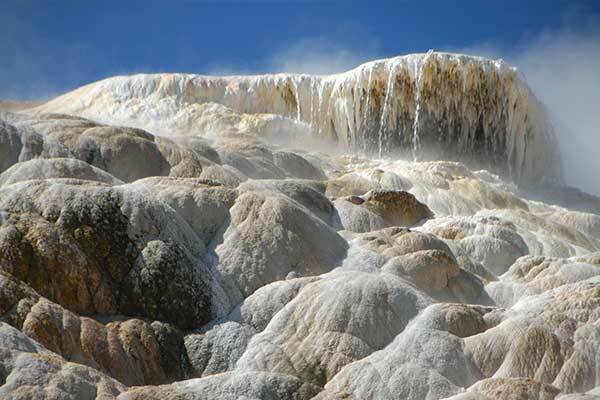 Travertine traditionally forms near hot springs and across the millennia, as the stone transforms from limestone, it develops a large number of natural pits. These pits exist throughout the stone. The surface pits are filled on the manufacturing level, but the subsurface ones cannot be. As the floor wears, the thin surface of the stone can wear, exposing unfilled pits. Fear not, though, because these issues are not as bad as they sound. Across a standard installation, there are typically only two to three tiles that require repair. To complete these repairs, we clean out the pitting and then fill the pits with a color matched polyester resin. We slightly overfill each pit to account for filler shrinkage. Once cured the filler is sanded flush with the tile. We then refinish the filled area to blend in with the rest of the surface.